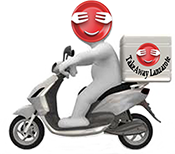 Burgers Delivery Playa Blanca Takeaway Lanzarote There are 6 products to choose from. Takeaway Lanzarote - Restaurants Playa Blanca Greek Burger 180gr : 180gr beef, feta cheese, olives, cucumber, smoked peppers , zaziki and fries . Takeaway Lanzarote - Restaurants Playa Blanca Provolone Burger : 180gr beef burger, rucula, provolone cheese, gratined with try tomato, pesto sauce and fries. Takeaway Lanzarote - Restaurants Playa Blanca Angus Manchego Burger : 180gr beef burger, spanish manchego cheese, red onions, bacon with argentinien chimichurri sauce (garlic) & fries.